Join the ShoutOut Board of Directors! We’re currently accepting applications for the role of Director. It’s a great opportunity to join a fun and committed team and make a difference in the LGBTQ+ community. The primary role of the Board of the Directors is to oversee the direction of the organisation. Unlike the Executive Team, the Board is not generally involved in the day-to-day administration (booking workshops, assigning volunteers etc.) but instead makes decisions regarding the broader policies, procedures and focus of the organisation. It is also responsible for the sustainability and strategic development of the organisation. Your primary responsibility would be to attend the monthly ShoutOut board meetings. At these, the board receives updates from the Executive Team, votes on any important changes and assesses what needs to be done next! Directors also take on a variety of other tasks when required i.e. assisting with grant applications, fundraising, writing the annual review etc. The role is flexible and can be adjusted to your own interests and time commitments but it’s important that you be ready to lend a helping hand with whatever job crops up. This is also a voluntary role. 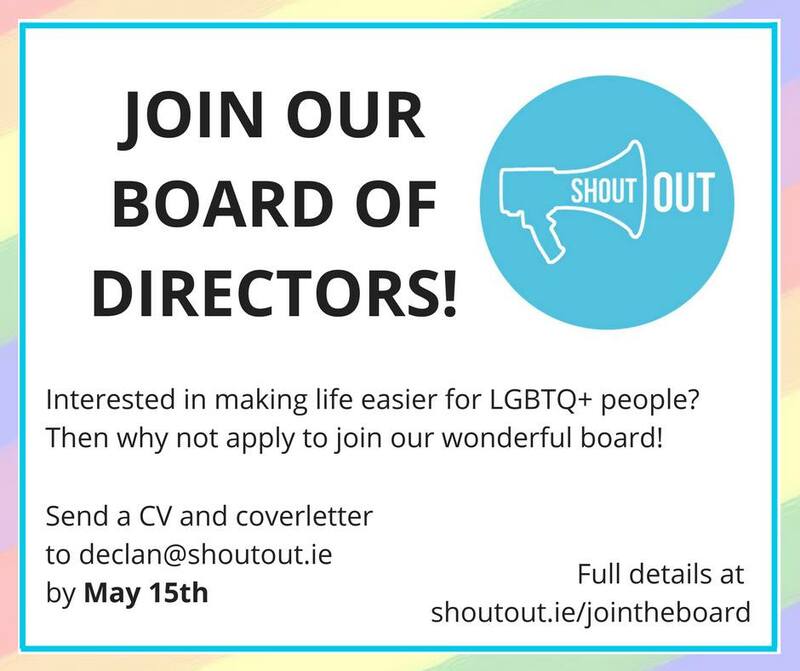 Please send a CV and cover letter to our Chair, Declan, at declan@shoutout.ie by May 15th. If you’ve any questions, you can also contact Declan at the above address.